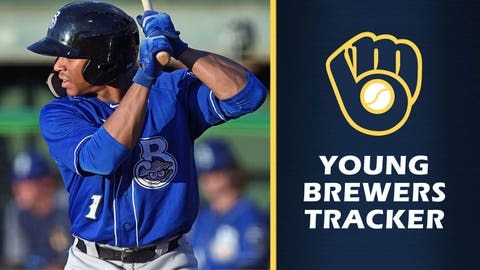 This is the 16th edition of the 2018 Young Brewers Tracker. Last week: 7 games, 25 AB, 6 H, 3 2B, 3 R, 0 RBI, 0 SB, 2 BB, 3 K, .240 BA. Notable: Erceg had back-to-back two-hit games Aug. 9-10 to boost his average to .262, but then went hitless in three games from Aug. 12-14. Season (Double-A): 56 games, 217 AB, .281 BA, .345 OBP, .419 SLG, .764 OPS, 16 2B, 1 3B, 4 HR, 28 R, 15 RBI, 10 SB, 16 BB, 42 K.
Notable: Hiura went 2 for 4 with his first Double-A triple on Aug. 11 then in his next games, an Aug. 14 doubleheader, was 3 for 5 with a double and a steal. Last week: 7 games, 24 AB, 5 H, 1 2B, 1 3B, 1 HR, 3 R, 2 RBI, 0 SB, 2 BB, 8 K, .208 BA. Season: 118 games, 466 AB, .251 BA, .338 OBP, .506 SLG, .845 OPS, 30 2B, 7 3B, 25 HR, 78 R, 68 RBI, 32 SB, 55 BB, 153 K.
Notable: Ray smacked home run No. 25 on the season on Aug. 10 (he had 12 combined in his first two minor-league seasons). He leads the Southern League in home runs and stolen bases, is tied for the lead in doubles, second in slugging percentage and runs and tied for third in triples. Ray is the only player at any level — majors or minors — with 25+ HR and 30+ SB (no one else in the minors with 30+ steals has more than 13 home runs; Washington’s Trea Turner is the only MLB player with 30+ steals (32) and he has 14 HR). On the downside, from Aug. 11-15 he was 1 for 18. Season (Double-A): 13 games (13 starts), 3-6, 3.53 ERA, 68.2 IP, 64 H, 4 HR, 22 BB, 63 K, .246 OBA, 1.25 WHIP. Season (Single-A): 9 games (9 starts), 2-1, 1.76 ERA, 51 IP, 37 H, 2 HR, 16 BB, 48 K, .208 OBA, 1.04 WHIP. Notable: Supak came off the disabled list Aug. 15 and pitched that day. While he allowed four runs (three earned) in five innings against Mobile, he didn’t walk a batter after having walked at least one in each of his last seven starts. Supak also has been charged with an unearned run in four of his last five starts. Last week (Pioneer): 6 games, 25 AB, 5 H, 2 2B, 7 R, 1 RBI, 1 SB, 6 BB, 7 K, .200 BA. Season (Pioneer): 11 games, 46 AB, .289 BA, .418 OBP, .356 SLG, .774 OPS, 3 2B, 0 3B, 0 HR, 13 R, 3 RBI, 2 SB, 10 BB, 10 K.
Season (Arizona): 13 games, 47 AB, .319 BA, .421 OBP, .362 SLG, .783 OPS, 2 2B, 0 3B, 0 HR, 11 R, 7 RBI, 8 SB, 9 BB, 6 K.
Notable: While Turang is hitless in his last three games, he did walk in each, meaning he’s reached base in all 24 games of his professional career thus far. Before his skid, Turang had only two hitless performances in his first 21 games, both with the Arizona League Brewers. Other notes: Colorado Springs OF Tyrone Taylor (2nd round, 2012) hit for the cycle last week, going 7 for 22 (.318) with a double, triple, home run and five runs. On the season Taylor is batting .263/.306/.472 with 15 home runs. … A tougher week for the veterans on the Sky Sox: OF Domingo Santana hit .250 with a homer but 11 strikeouts in 20 at-bats, C Jett Bandy was 4 for 20 and IF Tyler Saladino 2 for 20. … Colorado Springs C Jacob Nottingham has been on the disabled list since Aug. 1. … Making his first start since being promoted to Biloxi, RHP Conor Harber (16th round, 2015) tossed six shutout innings at Tennessee, allowing six hits with no walks and six strikeouts. Harber had a 2.26 ERA and 1.23 WHIP in 95 2/3 innings with Carolina. … Speaking of debuts, RHP Christian Taugner (37th round, 2017) tossed six scoreless innings in his debut with Carolina, allowing four hits and one walk with two strikeouts at Salem. With Wisconsin, Taugner had a 3.49 ERA and 1.25 WHIP over 22 starts. … Wisconsin RHP Aaron Ashby (4th round, 2018) allowed just four runs despite giving up 14 hits and five walks in 9 2/3 innings, but he did strikeout 14. In his four starts since being promoted, Ashby has a 2.66 ERA but a 1.57 WHIP. … By the way, if you didn’t see it, how the Timber Rattlers won their game Aug. 11 is something to behold. … Helena OF Je’Von Ward (12th round, 2017) was 9 for 22 (.409) with eight walks (.581 OBP). … Helena 1B Pablo Abreu hit two homers and had 12 RBI in six games.